The Arcopedico LS Beige is a high-quality anatomically-designed women’s comfort shoe that is hand-made in Portugal. The Arcopedico LS is a simple everyday casual walking shoe that fits almost any foot shape. The knitted upper of the Arcopedico LS is breathable and allows for many forefoot issues such as hammer toes, corns, bunions, metatarsalgia, Morton’s neuroma and calluses. 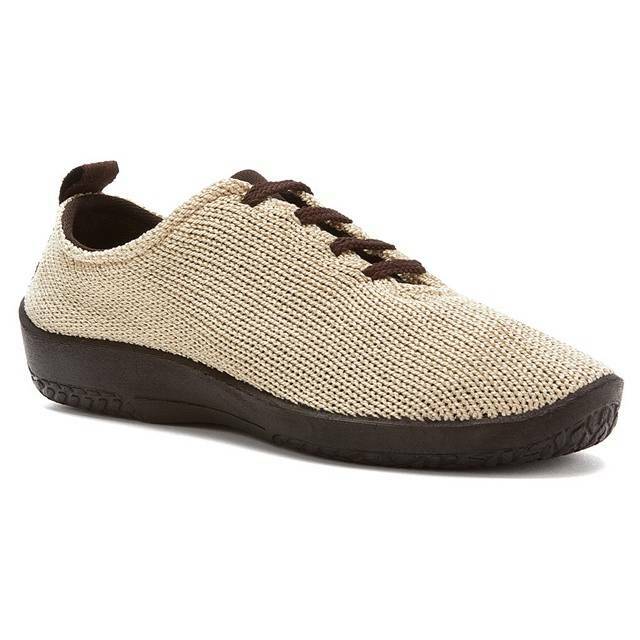 The Arcopedico LS Beige is also great for people with diabetes, arthritis and neuropathy because of the adjustability of fit and the soft breathable upper. The hallmark of all Arcopédico shoes can be seen in two fundamental design principles: the “barefoot” upper–a soft, non-binding design that that conforms to the top of the foot to allow circulation and all-day comfort–and the patented, metal-free twin arch-support soles (made from molded polyurethane), which protect the foot arch and allow the distribution of bodyweight through the entire plantar surface. In 2011, Arcopédico introduced the patented Lytech® material to the line, an innovative, ultra-light blend of polyurethane and Lycra®, which allows the shoes to be easily packed for traveling (shoe pairs weigh as little as 10.9 oz.) and machine-washed. Arcopédico’s Lytech shoes are also BioCalce Certified, introducing an eco-friendly, vegan, water-resistant and biodegradable option for Arcopédico customers.